Life insurance segment generated a 15.5% y-o-y GWP growth rate, to EUR 27.2 million, while the non-life insurance classes increased by 9.4% y-o-y, reaching EUR 134.3 million. At the "claims chapter", the aggregate value increased by 9.5% to almost EUR 64 million. Life indemnities' volume went up by 30.6% y-o-y to EUR 5.4 million, while on the non-life segment the aggregate growth rate was 7.9%, accumulating EUR 58.4 million. The largest life insurers in the country were CROATIA, GRAWE and WINNER VIG. Together, the three mentioned insurers accounted for 93% of the life insurance business. The non-life sector was led by the local subsidiary of Slovenian TRIGLAV (17.3% market share) followed by EUROLINK (12.9%) and MAKEDONIJA VIG (11%). 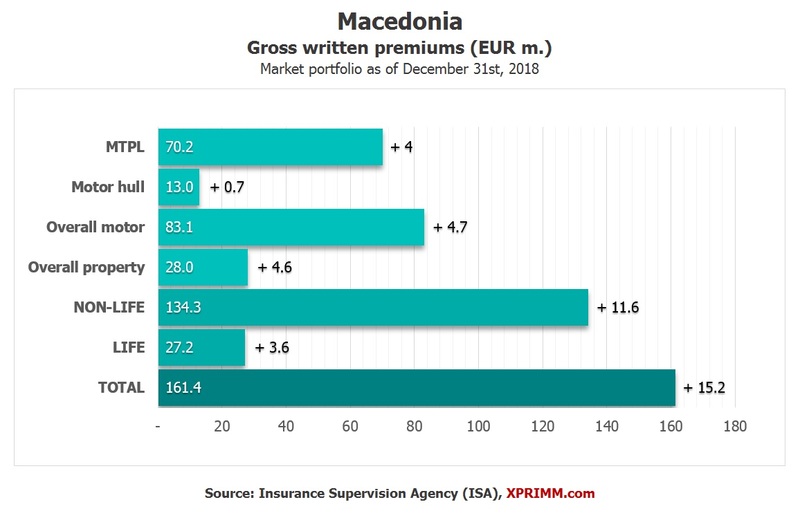 Access www.xprimm.com and download the FY2018 Macedonian insurance market statistics.